This article, with an exclusive video interview, originally appeared in T.H.E. Journal's April 2013 digital edition. Among the many technologies poised to reshape the way we communicate and interact with the world around us, few evoke the same sense of excitement and curiosity as augmented reality. Best known as the technology behind the visual overlays on televised sports games and Google's much-hyped Project Glass, AR seems intriguing and futuristic, if a bit lacking in practical uses for the average consumer. The same holds true in education, where, until recently, its impact on the curriculum of even the most tech-savvy districts has been limited to somewhat primitive efforts like QR codes. But AR's promise is enormous. In the 2012 K-12 edition of the Horizon Report, which examines a wealth of data to predict which ed tech trends will develop into mainstream successes, the New Media Consortium (NMC) named augmented reality an emerging technology with "significant potential" to transform K-12 education. The report anticipated widespread adoption in four to five years. Yet, for many K-12 educators who are just now exploring how web 2.0 and mobile technologies fit into their classroom, AR isn't a priority, primarily because its application to education still seems theoretical to most teachers. "The early adopters in K-12 are all over augmented reality," remarks NMC CEO Larry Johnson. "Individual teachers, individual programs, individual departments using AR are popping up around the country, and what we're seeing is very exciting, but it's definitely not yet at the point where we can describe its use as widespread." As the technology's profile is being bolstered by consumer applications like Project Glass, its impact on curriculum is also getting a lift, mainly from applications that leverage technology that students are already using. Augmented reality would hardly crack the consciousness of the average educator if not for the ubiquity of mobile devices, which provide fast access to the technology in a variety of settings. Depending on the scope or purpose of the application, AR typically uses one of two built-in technologies--the camera and GPS--to display information, data, videos, illustrations, or images based on the user's surroundings. With visual-based augmented reality, a user launches an AR app on a mobile device and then points the device's video camera at a subject. The app will identify key objects and layer information on the screen based on what it's "looking" at. For example, using an app like String, a user could point a smartphone at a triangle-shaped marker tacked to a wall, and a 3D prism will appear on their screen, ready to be rotated and manipulated. Location-aware augmented reality apps, on the other hand, use mobile devices' GPS capabilities to display information based on a user's coordinates. When a user passes a historic building, for example, a video describing that building's significance will launch on the user's device. Both types of augmented reality have become widely used in museums, allowing visitors to view educational and supplemental materials without needing a human guide or a device other than a phone or tablet. Researchers, both at the university and corporate level, have jumped into the science of AR, looking into how best to display data on consumer products--a car's windshield, for example--in a way that supplements daily life without being distracting. Moreover, as the NMC Horizon Report points out, a number of standout extra-school programs have incorporated AR into their curriculum. In the Super School University program, for instance, teachers and students from 34 countries are working as backpack journalists and scientists, using the uninhabited island of Santa Luzia, Cape Verde, for a virtual collaborative STEM project in which AR is a component of the custom software that has been developed specifically for this project. Even the traditional curriculum can be enlivened by AR. Letters Alive, a supplemental reading program utilizes AR via a 3D document camera to display 3D images of vocabulary words while teaching early literacy skills to students aged 4-8. 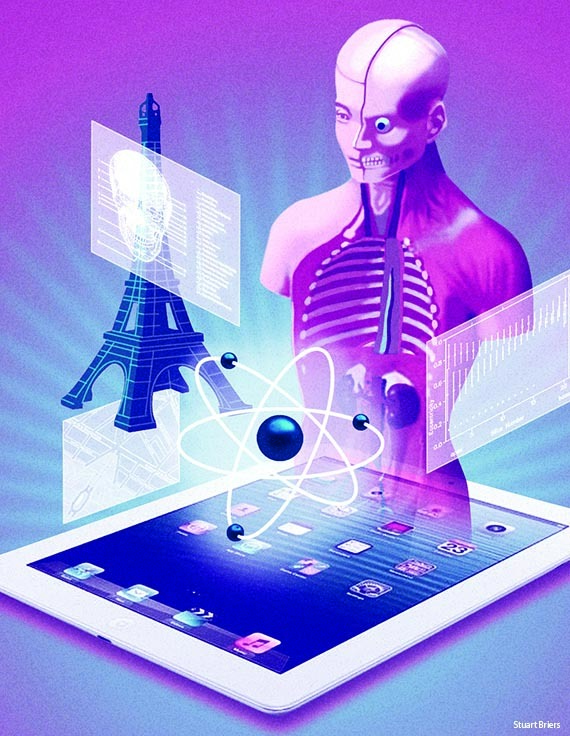 But some researchers see AR pushing the boundaries of the traditional K-12 curriculum. According to Chris Dede, Timothy E. Wirth Professor in Learning Technologies at the Harvard Graduate School of Education, the power of augmented reality lies outside the classroom, where it helps teachers bring structured learning to real-life settings and situations. "We're talking about situational learning, in which students are really understanding how to see contexts," explains Dede. "AR allows students to see an ecosystem through the eyes of a scientist, a mall through the eyes of an economist, or a cemetery through the eyes of an historian. The most important affordance of AR is that it provides an educational way of interpreting reality without having to rely on a skilled person to be physically present to provide that structure and knowledge." Dede also sees augmented reality as a key tool for achieving the transfer of knowledge from the classroom to real-life settings and scenarios. "Research on transfer has established that 'near transfer'--the transfer between two similar situations--is much more powerful than 'far transfer'--the transfer from something on a blackboard to that same thing in a real-world setting," he says. "The power of AR is that it opens up a kind of near transfer that has not been possible before in education. We can send students out into a real-world setting, and the AR provides the scaffolding and structure for their learning, but they're right there in the real-world setting where these concepts exist." One thing that's been holding AR back, though, is that authoring systems are still developing. The team at NMC sees a lot of new AR applications being developed using a free/low-cost app called Layar, and Dede anticipates that more mature, inexpensive or free AR authoring systems will be available within the next two years. Dede also predicts that as AR technology becomes more user-friendly, teachers and even students will be able to design and create AR within an hour--taking much less time and technical knowledge than would be necessary to create a virtual world. "The promise of teachers being able to customize AR templates to their own unique locations is definitely there," says Dede. "In fact, eventually we'll be seeing students augmenting their backyards and inviting their friends over for reciprocal ecology experiences." In addition, because augmented reality is so new, AR best practices for K-12 education are still being established. "Design--what makes an augmented reality effective and useful rather than just cool--takes time to establish," says Dede. "I think within three to four years, we'll have really good rules of thumb that we can give to teachers, students, and other educators about how to build augmented reality that's both engaging and educationally effective.… A number of people are working hard to put together design guidelines and evidence." Two of those people are Jason Beach and Jeremy Wendt, both professors of instructional technology in the College of Education at Tennessee Technological University. In his courses, Beach instructs his students how to enhance content delivery using augmented reality. "I show my preservice teachers, for example, how to display 3D representations of objects that are typically seen only in two dimensions using Chemistry Review, a chemistry augmented reality app," he explains. "So, instead of looking at the small ball and rod examples that they use in chemistry books, you can point the camera of your mobile device around the room and actually interact with molecules in your 3D environment." For elementary preservice teachers, Beach demonstrates how to use a free app called AndAR to display the interior dimensions of 3D shapes like cones, cubes, and spheres by pointing a camera at 2D markers. The goal is to help young students better understand the differences between the shapes, a Common Core requirement. "It helps build students' spatial reasoning because they can zoom in on these objects and interact with them in the virtual space, and it gives students an understanding of what these objects look like in real life without requiring teachers to spend their classroom budget on physical models of these shapes," Beach explains. An added benefit of augmented reality is that it uses technology that most teachers and students use regularly in their day-to-day lives. "The majority of our preservice teachers already have an iPhone or an iPad, so when we demonstrate these AR apps in class, they can immediately download them on their own device and begin using them on a day-to-day basis," Wendt says. "Because of that, they can very quickly see how to apply this technology to their classroom, and they're very excited to put it into practice." With mobile technology growing more powerful, ubiquitous, and inexpensive, the hardware and apps to support AR have evolved to the point where augmented reality can be a go-to technology for forward-thinking K-12 educators. "Augmented reality is mature enough now, and we're confident enough about its benefits, that it's definitely something that interested teachers and educational leaders should start to explore," says Dede. "This is not some pie-in-the-sky technology. Augmented reality is a logical piece of the concept of life-wide learning that was described in the 2010 National Ed Tech Plan, and the biggest single obstacle to wide-scale implementation is just getting people to recognize its potential and be willing to experiment with augmented reality in their own classrooms."